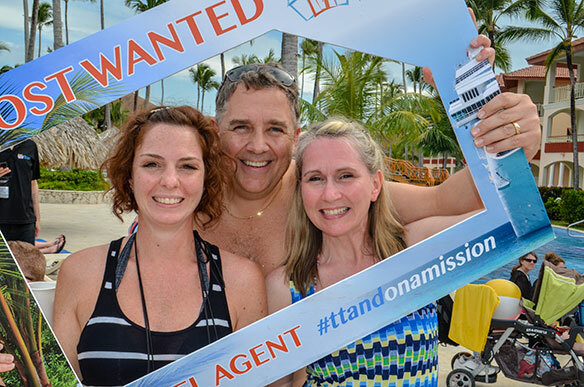 About 140 agents from TTAND came to the conference at the Majestic Colonial all-inclusive resort on the popular beaches of Punta Cana in mid-April. And, while most of their week was spent working to gather industry knowledge through presentations by the assembled suppliers, they also had time to enjoy the resort and experience a bit of the destination, including the attractive beaches. Agents had two days to soak up these experiences. By networking, they get valuable information, for example, on the experience of working with various suppliers, said TTAND agents Donna Wright of Okotoks, AB, Stacey Knight of Compass Vacations, and Vanessa Dawson of Focus on Photography Tours in Ottawa. “We get referrals and recommendations from each other,” said Knight. Back on the schedule, agents took in an agenda that included one-on-one meetings with the 24 suppliers who had come to the event, as well as a series of training courses. These covered self marketing, self management, websites, social media, year one marketing, groups and market niches, and ClientLinq. A panel made up of a mix of suppliers and agents also brought their best tips for creating effective destination events for consumers. “Attending the TTAND conference is like being able to do 140 sales calls in one week,” said Aubrey Schmidt, the business development manager for Goway Travel in Canada. “I could never manage to do that for the same amount I spend to attend this,” said Schmidt, who had come to his third TTAND conference. Agents also got the opportunity to break out their best party gear, at a series of evening events. These included a Spy vs. Spy party on the beach, a Red & Black masquerade event by AM Resorts/Air Canada Vacations, a Rock N’ Roll dinner/party by the Hard Rock Hotel, and the final night Rising Star awards dinner. Attendees ended their TTAND conference experience with news that a new partner incentive program would be boosting some bank accounts. Specifically, the profit sharing incentive was offered to agents whose sale of preferred and approved suppliers was 70%-plus of their total sales. TTAND did not specify the number of agents who were awarded the extra amount, but did say that about 65% of the agent roster qualified to receive the profit split.